The midfielder, 26, has praised United's caretaker manager Ole Gunnar Solskjaer and says he has a "great relationship with him". But he also told a news conference: "Real Madrid is one of the biggest clubs in the world. I've always said it is a dream club for every player." Pogba is set to feature for France in Euro 2020 qualifiers against Moldova on Friday and Iceland on Monday. Solskjaer's arrival coincided with an uplift in form for Pogba, who scored four times in his first three games under his new boss. "Of course we want him to stay," said Pogba, who is under contract until 2021. "The results have been great. I have a great relationship with him; he has a great relationship with the players. "He is a really happy coach that gave confidence back to the players. This gave us the freedom to play and enjoy football again because maybe we lost that with the results we had before." 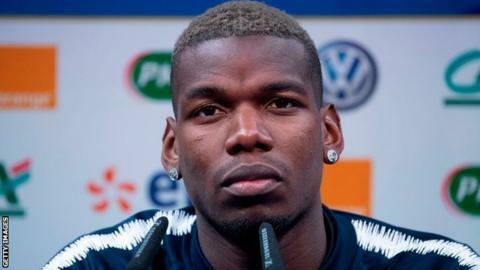 "We are better now and the results have been brilliant," added Pogba. "I like to talk about the future because that's what matters, I don't like to talk about the past. Maybe we lost confidence, maybe things went wrong. A lot of talking outside that we weren't used to."